NETWORK FINALS: Game 1 of the NBA FINALS adjusted to 6.9, down 0.4 from 2016. 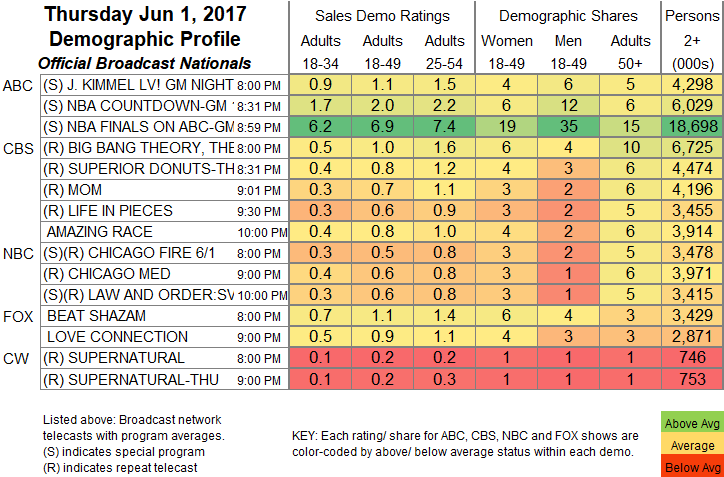 In addition, LOVE CONNECTION and the AMAZING RACE season finale gained 0.1 in final numbers. CABLE HIGHLIGHTS: Even though the game itself was on ABC, ESPN’s pre- and post-game coverage of the NBA FINALS gave it the top 3 cable telecasts on Thursday, topped by 0.45 for the pre-game special. (During the game itself, ESPN aired the NATIONAL SPELLING BEE at 0.20.) The US exit from the Paris Accords drew a crowd for Fox News, where TUCKER CARLSON TONIGHT led news telecasts at 0.33/2.9M, with CNN’s ERIN BURNETT UPFRONT at 0.30/1.2M and MSNBC’s RACHEL MADDOW SHOW at 0.28/2.4M. Comedy Central’s THE DAILY SHOW continued its strong weak in the Top 10 at 0.31, with lead-out THE PRESIDENT SHOW up 0.08 from last week to 0.17. On Lifetime, MARRIED AT FIRST SIGHT rose 0.04 to 0.30, and SECOND CHANCES ticked up to 0.14. 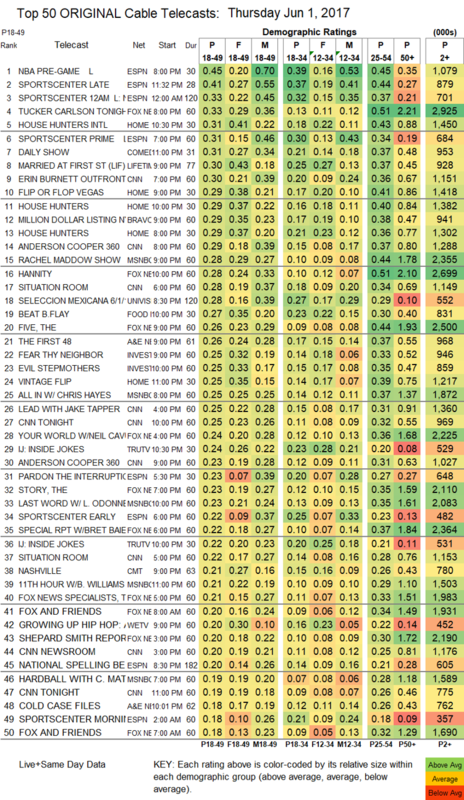 On HGTV, FLIP OR FLOP was up 0.01 to 0.29, and HOUSE HUNTERS was at 0.29/0.29 compared to last week’s 0.27/0.23. Bravo’s MILLION DOLLAR LISTING was steady at 0.29, and CYRUS VS CYRUS was down 0.06 to 0.11. Food Network’s BEAT BOBBY FLAY dropped 0.03 to 0.27. On ID, both FEAR THY NEIGHBOR and EVIL STEPMOTHERS were at 0.25, respectively down 0.04 and 0.03. A&E’s FIRST 48 fell 0.04 to 0.26, and COLD CASE FILES was at 0.16. CMT’s NASHVILLE returned for the rest of its season at 0.21, down a tick from its last airing in March. We’s GROWING UP HIP-HOP shrank by 0.09 to 0.20. E!’s SECOND WIVES CLUB gained 0.03 to 0.15. POP’s IMPACT WRESTLING lost a tick to 0.07.